Ah... too bad that posting wasn't 18 months ago. Kinda committed to my current job for the foreseeable future. Well if you have a passport I'd assume it wouldn't be too difficult. Of course I guess you should never underestimate government's ability to construct red tape, nor just how long it can take to get through it. Its a shame that I am not qualified for any of those positions, and I really need to learn C++ on my own, since DeVry doesn't teach it anymore. You definitely need to pick up on it if you're going into the programming world. I'm surprised they've removed it from their program. Good luck, this could be quite a fun and challenging opportunity. It's worth learning. I was quite fond of C++ starting off and really enjoyed the challenge of creating multi-threaded applications. Whether it's necessary or not would depend more on the field you plan to enter. More likely the reason it's not offered is because a lot of businesses rely on Java or C# now for development. I haven't touched C++ professionally for many years because of the transition to languages such as Java or C#. If your interested in learning C++ but still want to stay at DeVry then take a supplemental course at another institution or online. No kidding, its definitely worth learning, since most video games are coded in it nowadays, and video game development is what I am interested in, though I am not sure if I want to code my days away or not for the rest of my life. I think I should be able to learn it on my own, its after all not that different from C# and Java, and I know quite a bit about both of them. Well, I envy you guys just starting out. I'm much more locked into my position/situation and can't really risk my families stability for something like this (not that I meet all the gaming qualifications, but had I made other choices in life I very well could have been there as I started with Math/Comp Sci). Heads up Guys – Ironclad is located in the Greater Vancouver Area of British Columbia Canada- we are getting some applicants saying “hey, I live close by in Michigan, and would love to make games with you” … Sure! if any of you Hosers want to take off to the Great White North (although you will find Vancouver winters more grey than white -if you’ve been to PAX west – think Seattle with fewer Starbucks). Being a learned individual that lives in the Upper Peninsula of Michigan (the part connected to Wisconsin ... not Detroit), I feel it is my duty to educate a few would-be applicants so that they are better prepared for the job application and interview process. 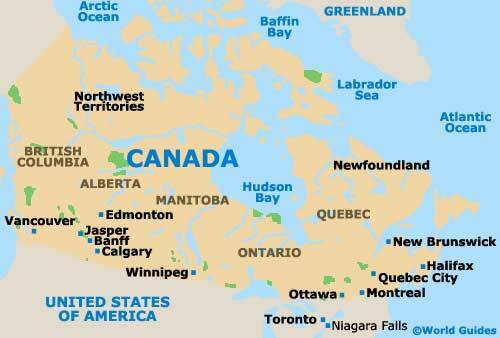 As you can see ... Vancouver, BC is on the WEST side of the map. Michigan is near Toronto which is much nearer to the Buffalo, NY area on the East-ish side of Canada than it is to the Vancouver area. You're talking three to four hard days drive to go from Michigan to Vancouver! [quote who="boshimi336" reply="13" id="2994178"]As you can see ... Vancouver, BC is on the WEST side of the map. Michigan is near Toronto which is much nearer to the Buffalo, NY area on the East-ish side of Canada than it is to the Vancouver area. You're talking three to four hard days drive to go from Michigan to Vancouver! not if you use a phase gate. Quoting wbino, reply 14not if you use a phase gate. When that happens they wouldn't have to view the forums, we'd be stopping any time we had a great idea to write it on their white boards! Having now been out to your neck of the woods, I feel there are sufficient Starbucks. I have just read about the "User Interface / 2D Artist / Layout / Game Art Painting - Part Time" I have designs of my own ship styles in a 1/4 bond paper until now I keep them because I am amaze of my design, however, the only problem is that I am still learning how to use 3DS Max and apply that ship design and import it in Sins of a Solar Empire, and I have just start learning 3DS Max yesterday (Sept. 10, 2011). Ahahaha! Quoting Oodel, reply 12Heads up Guys – Ironclad is located in the Greater Vancouver Area of British Columbia Canada- we are getting some applicants saying “hey, I live close by in Michigan, and would love to make games with you” … Sure! if any of you Hosers want to take off to the Great White North (although you will find Vancouver winters more grey than white -if you’ve been to PAX west – think Seattle with fewer Starbucks). The first time I read that, I thought you said you felt there were sufficient Starbases. Can I apply for Part Time but only with the 3D Modelling? I'll see if I can put my own textures in 3DS Max. I have just made my own ship designs but has no textures of my own yet, I have just use some default textures from 3DS Max but it went out good. 1) What does it mean by portfolio? 2) What does the portfolio contains? I am 19 years old, and I am here on Philippines. Would that be possible for me to apply for Part Time? A portfolio is examples of your work, whether it be code, 2D art, or particle effects that you have done. Hm... I have done my third 3D Spaceship, I think that will be part of the portfolio then.